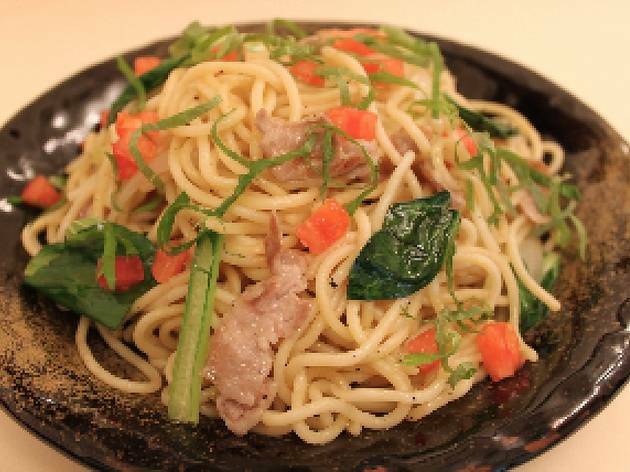 A curious hybrid of yakisoba and standard spaghetti, the noodle dishes at this branch of the RomeSpaBalboa chain (they also have shops in Nihonbashi and Toranomon) will be attractive to those tired of standard Italian-style pasta. The extra-thick noodles are mixed with meat and veg, sprayed with thick sauce and lightly fried, making for a savoury but relatively light dish. 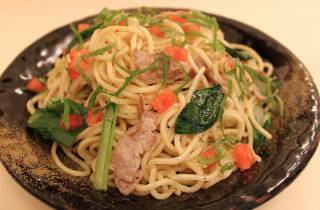 The menu stays true to Japanese spaghetti tastes, offering choices like 'napolitan' and shiso leaf-flavoured tomato sauce, and sizes range from standard (350g, ¥600) to 'mega' (1,000g, ¥1,200). A welcome cheapo addition to the Hibiya Park restaurant scene.